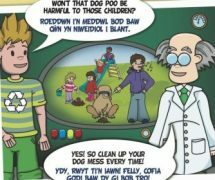 Dog fouling across Rhondda Cynon Taf is a major problem and the Council is cracking down on irresponsible pet owners. 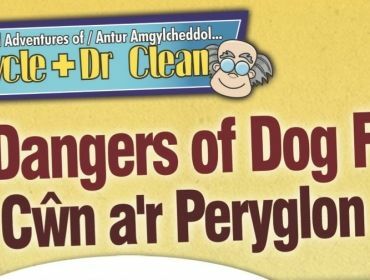 In a bid to keep the County Borough clean, tidy and free from harmful dog waste the Council has teamed up with DR Clean and his Green Machine and will be watching out for eco-criminals who commit the eco-crime of dog fouling! Under the Dogs (Fouling of Land) Act 1996 it is an offence if you allow your dog to foul in public places and then fail to clean up the waste and dispose of it properly. A public place includes roadways, footpaths, parks, car parks, shopping centres and other people’s gardens – basically anywhere that there are public! If you fail to clean up after your dog you could face a hefty fine of at least £75, a criminal record if you fail to pay the fine or even worse you could endanger the life of others. The biggest threat to public health from dog excrement is toxocariasis. Toxocariasis is an infection of the roundworm toxocara canis. The eggs of the parasite can be found in soil or sand contaminated with faeces and if swallowed, result in infection that lasts between six and 24 months or sometimes a lifetime. Symptoms include eye disorders, blindness, vague ache, dizziness, nausea, asthma and epileptic fits. Often the eggs are ingested when passed to the mouth by the hands, but this can also occur through contact with dogs or other inanimate objects including the wheels of toys and the soles of shoes. Infected soil samples are often found in play areas and as a result, Toxocariasis most commonly affects children between 18 months and five years. Rhys Cycle regularly visit schools across Rhondda Cynon Taf accompanied by the Council’s Streetcare Enforcement and Awareness team to highlight the dangers of dog fouling and more and more young people are now joining in the fight to help stamp it out. 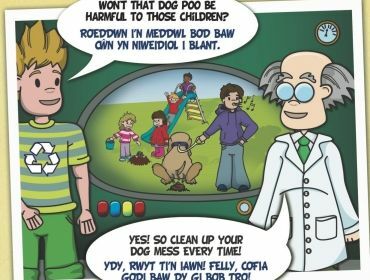 All around the County Borough you will see dog fouling posters designed by young people highlighting the implications for dog owners who fail to pick up after their dogs. The Streetcare Enforcement and Awareness Officers have the power to issue on-the-spot fixed penalty notices of £75 for each dog fouling offence.